Say there is data from a related table on the pop over, i’m curious when that get retrieved and sent “down to wire” to the client… on layout load, or pop over activation perhaps? That is a great question, Drew. Which is a neat way of saying that I don’t know. I will post the question in TechNet and see what I get back. This may be a silly question, but now did you manage to reformat the portal scroll menu? James – The database in this article is the Invoices starter solution that comes with FileMaker 13. You can create a copy of it by choosing the menu File > New From Starter Solution. The styling for the portal is part of the Enlightened theme in the file. 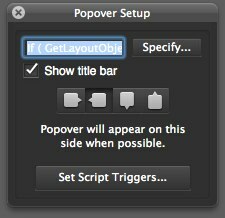 Can you print a popover window?